Assessment, planning and design. Configuration. Installation. 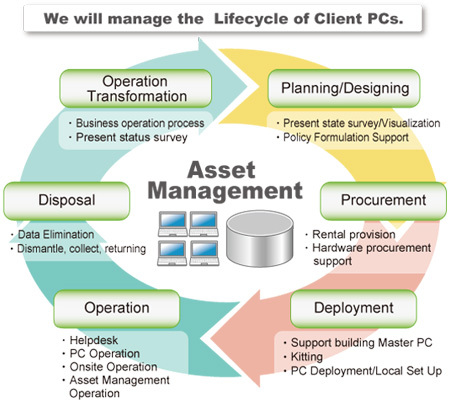 Asset lifecycle support and management. We handle it all from researching equipment that will best meet your needs to replacement of technology and proper disposal of old equipment. Prior to any solution purchase, an organization should assess how its current desktop fleet is working to identify any unfulfilled needs. Having a full understanding of your staff, the firm’s processes and the technology at its disposal will then allow you to map out and design the perfect solutions for your organization’s needs. Getting the initial deployment of your desktop solution right is crucial, and will save money and future headaches. A detailed understanding of your staff’s computing needs will allow you to provide the optimal features that they need to excel at their jobs. Deploying a desktop solution is no simple matter. A good deal of forethought and planning needs to go into a successful installation. Addressing all of the system-wide issues and the finer details of how the solution works in the cubicle or office is a necessity for a good rollout. This is the heart of a good DLM solution and includes resource tracking, help-desk support, maintenance, warranty and software licensing management, patch management and end-of-life disposition.